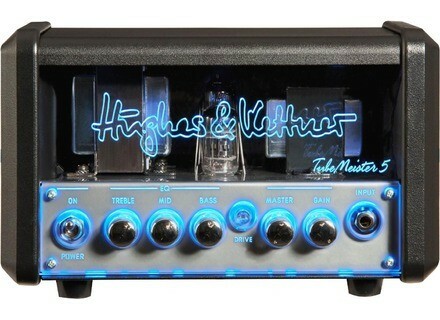 TubeMeister 5 Head, Tube Guitar Amp Head from Hughes & Kettner in the TubeMeister series. 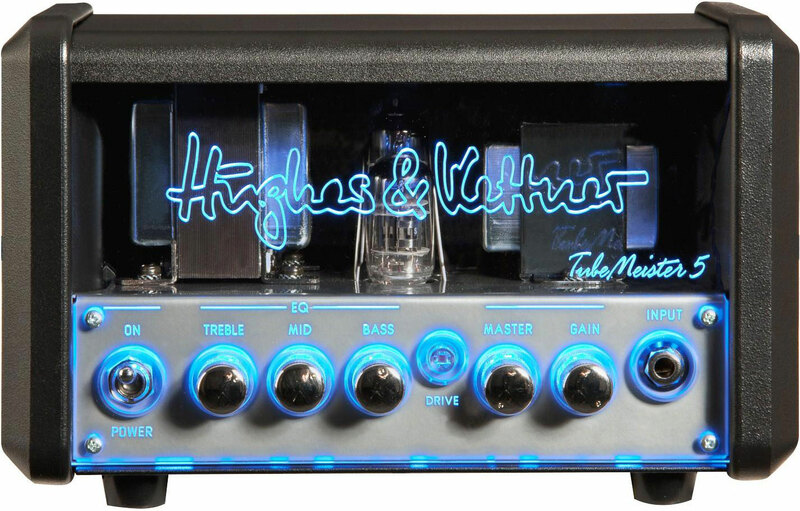 Hughes & Kettner have unveiled their latest amp, the TubeMeister 5, on their website, saying, "The TubeMeister 5 stands as a testament to the knowledge and passion of Mr. Hughes and Herr Kettner." The amp has a single channel plus overdrive, and weighs 3.5 kg. The clean section is designed for "warm tube tone with dynamic range that sweeps from sparkling clean to throaty crunch," while the drive section is designed to go from "edgy overdrive to soaring lead sounds." The amp has a three-band EQ and features a 12AX7 in the preamp and a 12BH7 dual triode push-pull power section. It also features oversized transformers designed for greater headroom on Clean settings and more punch on Drive tones and an automatic/switchable Power Soak with silent recording functionality. In addition, there is a speaker-emulated Red Box Out for recording. The amp measures approximately 10" x 6" x 6", or 253mm x 156mm x 149mm, and will be available January 2012. No pricing info yet. Electro-Harmonix Switchblade+ With a passive audio path and active LED indication, this new pedal is designed to offer a solution to a player’s switching needs.